The summer 70.3 group training program is designed for athletes looking to compete in a late July/August/early September half Ironman. For a full list of races, visit the Ironman site here. To inquire about additional prorated pricing options, email us. This program has been designed by Sharone Aharon, USAT Level III coach, to meet the training requirements of athletes at any ability level. All participants receive an online training program, which details exactly what to do each day to reach your specific race day goal. 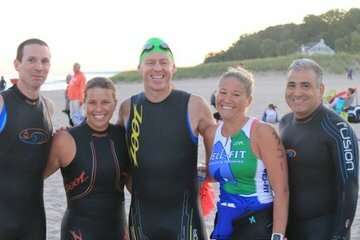 Participants will train with like-minded athletes three times per week, guided closely by Well-Fit’s USA Triathlon-certified coaches who will not only share knowledge but provide additional motivation. Three classes each week will take place at the world-class Well-Fit Training Center, the Whitney Young Pool, the UIC Physical Education Building Pool, the Lakeshore Track, Northerly Island and Ohio Street Beach. Dates and times are listed in the class registration section below. The program includes a fully-supported 56-mile group ride. The program will be led by Coach Ted Ramos, who has years of experience helping athletes accomplish their goals at the half-Ironman distance. He will be assisted by other Well-Fit coaches and Elite Team athletes. *Payment plans are available. Please choose at checkout. **CTC/CARA Members, please select CTC at checkout. Your status will be verified by Well-Fit. ** Class cost will be refunded 50% if canceled no later than 2 weeks prior to the start date. After 2 weeks there will be NO REFUNDS. Injuries will be dealt with on a case to case basis.